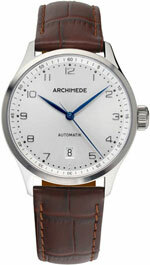 The new model Klassik 39, presented by the German watch company Archimede, a new version of the eponymous line of watches. From the name of the model it becomes clear that the diameter of the shell is only 39 mm, which in the previous model was equal to 42 mm. At the moment, when the case is widely popular “giant” size, this pretty risky move by the company – to reduce the diameter of the body, especially in the male model, but the novelty is so great is that this step of the grade is justified. Round casing is made of new brushed stainless steel with a diameter of 39 mm and 10 mm thick. The case is waterproof to 50 meters from the front side is protected by sapphire glass, but the back cover of the model is made in two versions – mineral glass and steel. 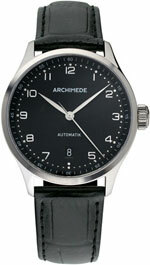 Dial in a restrained classical style, which is ideal and easy to read, has a few options: brown, black and silver. The markup in the form of overhead Arabic numerals reinforce the “vintage” model. Rounding out the classic image listevidnye, blued central arrows, which are also still rodirovany. Time display is carried out by the central arrow hours, minutes and seconds. The aperture is placed in the position of the date of 6:00. New Klassik 39 was designed based on the ETA 2824-2 automatic movement made in Switzerland. The unique size, collected at 25 stones, makes 28,800 vibrations per hour. Klassik Model 39 is supplied to an elegant leather strap in black or brown depending on the color of the dial, equipped with a stainless steel buckle. You can buy a watch for a very reasonable price – for just 710 dollars.